Gallons of icing, pounds of chocolate and countless sheets of gingerbread went into building these 13 inventive and incredibly detailed creations, from a towering homage to an '80s comedy film classic to an entire German-Hawaiian gingerbread village. The mother-daughter duo behind Ardsley, New York's Riviera Bake House took inspiration from daughter Liv Hansen's favorite childhood fairytale to create their 2-foot tall structure. No candy was used to decorate; Liv instead completed detail work using a pipeable, watered-down recipe for gingerbread. She sculpted all of the mice and the Pied Piper from marzipan, and constructed the roof from cereal. The team dedicated five days to the project, using approximately 10 pounds of gingerbread and 2-3 gallons of icing. 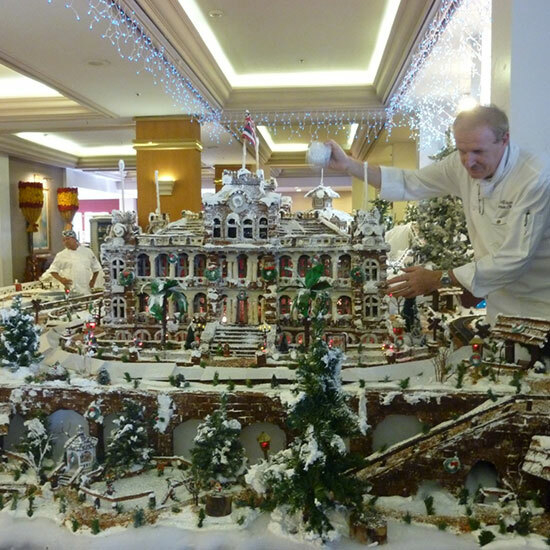 Hotel executive chef Ralf Bauer and a team of culinary architects spent over 660 hours designing and constructing a gingerbread village that paid homage to both Bauer's native Germany and to old Hawaii. Medieval churches, bell towers, train stations, a carousel and skating rink mingled with iconic Hawaiian structures like the Kawaiha'o mission church and the magnificent Iolani Palace. The winter wonderland stood over 14 1/2 feet high and 24 feet wide and was made with 200 gallons of icing, 100 pounds of dark chocolate, 30 pounds of white chocolate and 60 sheets of gingerbread. 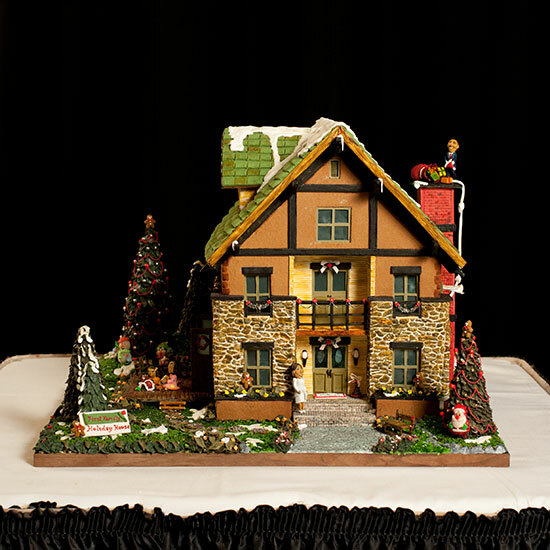 Carolina Montoya and husband Fernado Puga spent 302 hours over the course of two months to create their gingerbread house. The traditionally-designed structure featured President Barack Obama, who appeared to be climbing out the window and up onto the chimney with a bag full of toys. 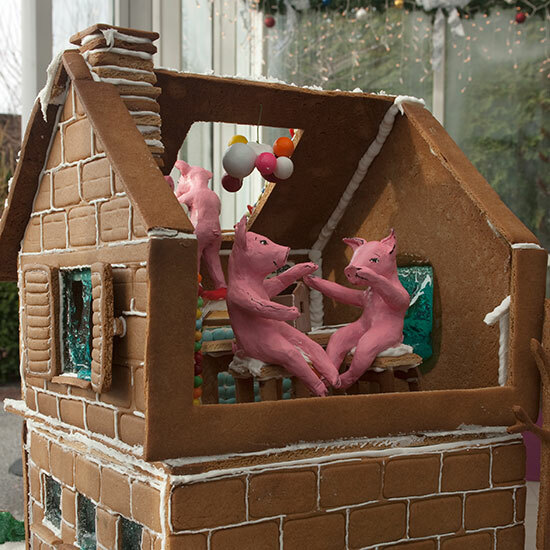 Montoya and Puga's all-edible entry was constructed of gingerbread, fondant, gum paste, coconut, Rice Krispies cereal and breath strips for window panes. Prompted by the theme "Reel Christmas," a team of Seattle Sheraton culinary staff and area architecture firm DLR Group created this cheeky homage to the 1983 Christmas comedy film classic A Christmas Story. 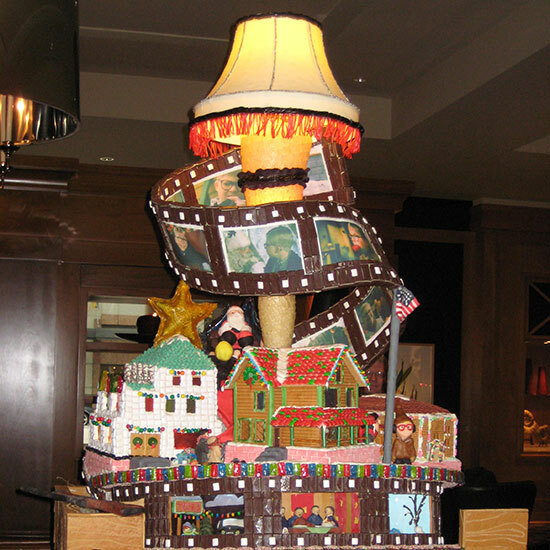 Weighing around 200 pounds, the gingerbread structure featured edible reenactments of memorable movie scenes—including fondant versions of Ralphie and friend Flick by the flagpole in an amazingly detailed gingerbread neighborhood, and a recreation of the film's iconic leg lamp sporting licorice "fringe." 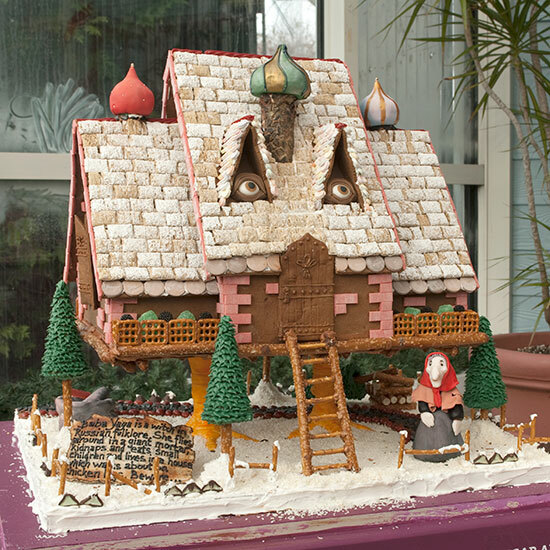 Irina Brandler, a Russian immigrant and owner of Sugar and Spice Bake Shop in Bronx, NY, headed a team of four bakers to make a gingerbread house for Baba Yaga, a witch-like character from Russian folklore who lives in the forest in a hut that stands on chicken legs. Irina's version of the house stood more than two feet tall and featured a roof covered in shredded wheat cereal and Necco Wafers®, pretzel fences and ladder, a trail formed with Boston Baked Beans candy, and Christmas trees made of frosted ice cream cones and pretzel rods. Three domes on the top of the house were all shaped out of fondant—one dome made of a Hershey's chocolate kiss melted and had to be replaced. 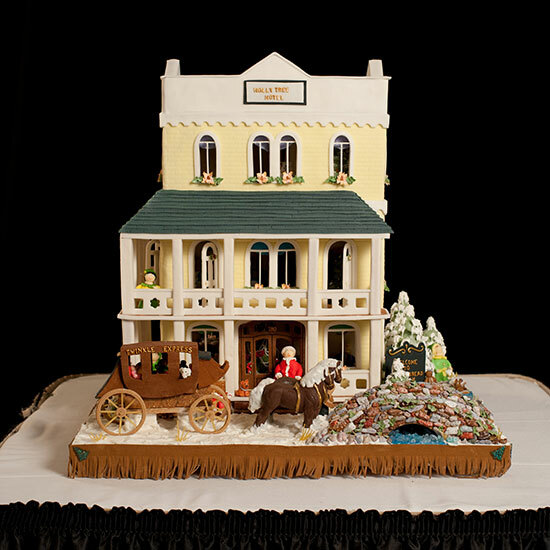 Ten-year-old Lydia Gentry of Hendersonville, North Carolina, made creative use of edible materials to construct her prize-winning gingerbread house. Lydia thatched her cottage's roof with shredded wheat cereal, used chocolate rocks on the foundation and chimney, and poured hard candy to create the cottage windows. Outside, frosting-covered pasta formed porch supports while a chocolate candy and tapioca pearl walkway wound its way beneath a vine-covered trellis (gum paste, pasta and frosting), past rose bushes made of crushed cereal and marshmallow, and through a lawn made of frosting and speckled with coconut "snow." 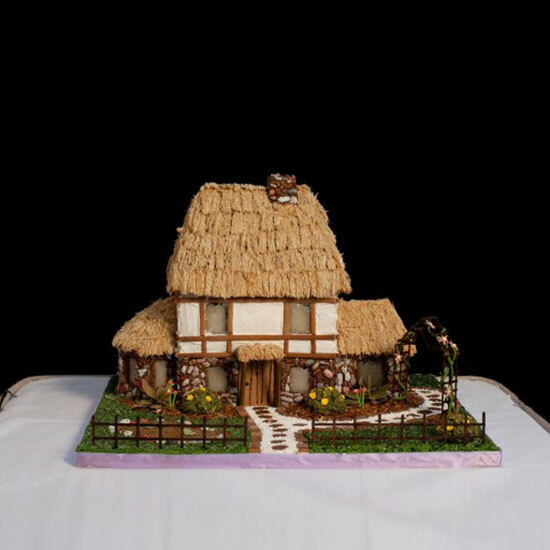 For her fairy-tale-themed confection, Cake Power's Kate Sullivan constructed an 18-inch-tall gingerbread house featuring three little pigs and a wolf all made of fondant (the original versions, made of modeling chocolate, melted in the Botanical Garden's greenhouse). The house itself, constructed of embossed gingerbread, featured such incredible tiny details as a jellybean-covered fireplace, string licorice rag rug, gumball lamp and vase, windows made of poured blue-tinted hard sugar, and a whimsical hanging portrait of a Star Wars clone trooper drawn in food marker. Rita and Monte Adams' scene tells the story of Santa getting ready to ride out of an old western town following dinner at the Jingle Café, gift shopping at the Rocky Mountain toy shop and a night's rest at the Holly Tree Hotel. In the scene, Santa has saddled up a solid chocolate horse while elves have loaded his coach with Christmas toys. 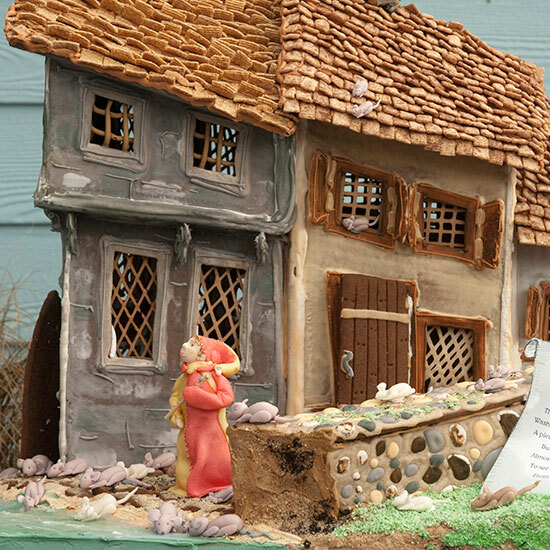 The couple used 15 pounds of flour, 22 1/2 pounds of fondant, 12 pounds of sugar and dozens of other ingredients to make this gingerbread tableau. It took four full days, two bakeries (Kate Sullivan of Cake Power and Patti Paige of Baked Ideas) and two interns to complete this theatrical project from beginning to end. 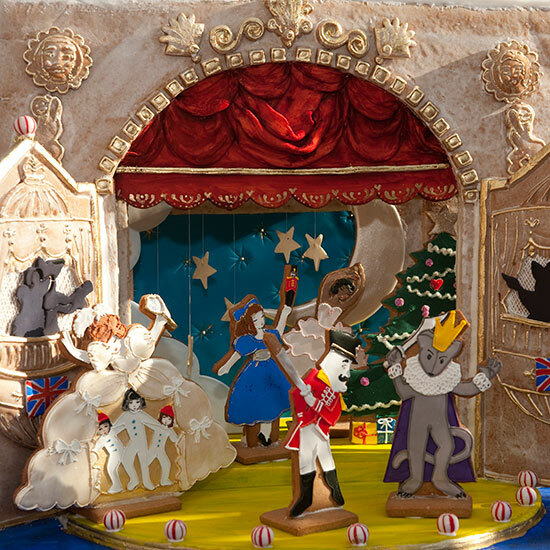 Modeled upon the stage of the London Coliseum opera house, the structure—measuring 18 inches tall—and characters were all made of gingerbread, while the red curtain above was covered in fondant. Everything except the red-and-white striped mint balls was either baked from scratch or rolled, cut, piped or painted in food color by hand. 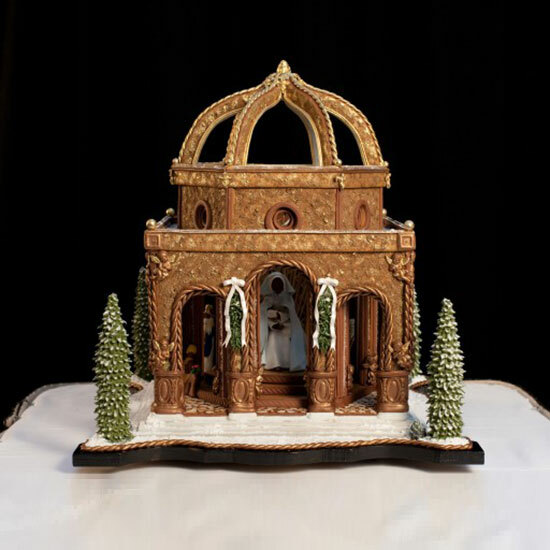 Inspired by a photograph of sunlight illuminating the Bernini sculpture, "Ecstasy of Saint Teresa," in Rome, Billie Mochow set out to construct a gingerbread recreation that also appeared to have light coming from it. She began her building from the inside out, forming the mother and child figures from gingerbread and "dressing" them in gumpaste. The faceless people surrounding were similarly constructed from hand-cut gingerbread cookies dressed to appear dimensional. Outside the architectural cathedral, Mochow stacked ice cream cones to form the snow-covered evergreen trees. 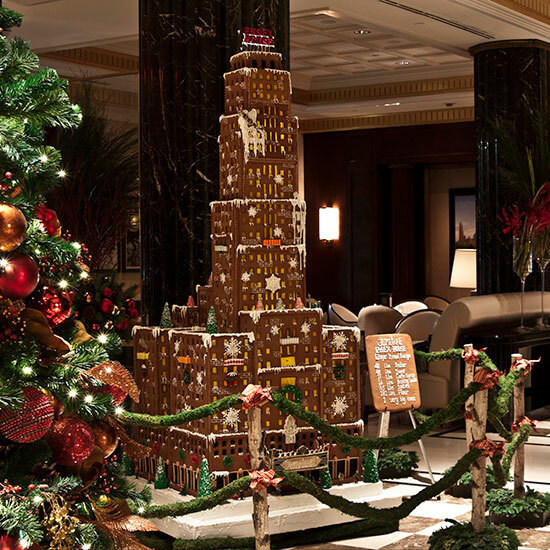 To benefit the hunger-fighting nonprofit City Harvest, this hotel invites local restaurants and bakeries to submit beautiful gingerbread houses for a yearly contest. The public is welcome to view the display (which includes this impressive replica of the Central Park Boathouse) in the lobby’s 56th Street atrium and can vote on a favorite by donating $1. Bonus: Hidden behind a curtain, the hotel’s Burger Joint makes a great stop for a quick meal. 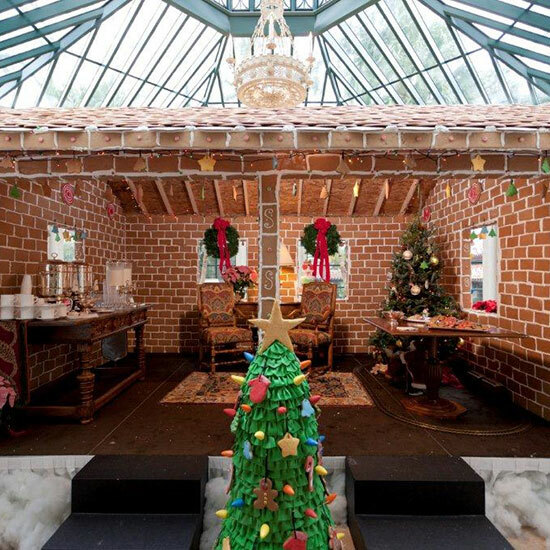 The pastry crew at this Georgia resort baked 3,000 gingerbread bricks to construct a sweet-smelling house decorated with gingerbread people, gumdrops, candy canes and chocolate Christmas trees. Not only is the house large enough for guests to enter, but they can also sit inside with a hot chocolate while eating gingerbread cookies. 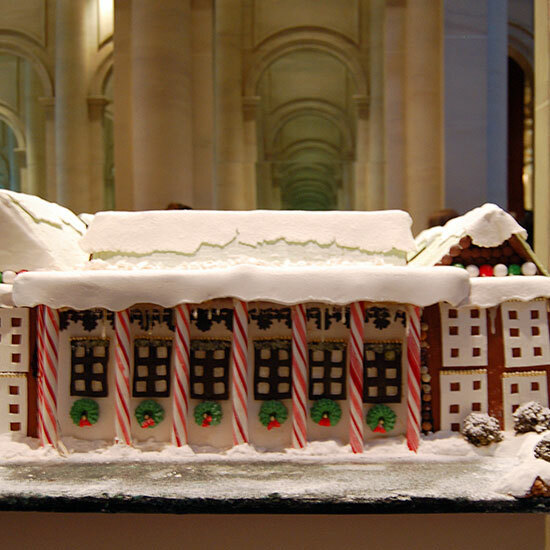 Throughout December, the hotel's executive pastry chef, Deden Putra, is hosting Saturday morning classes that teach kids (and parents) how to construct and decorate gingerbread houses. Last year’s display proves Putra’s qualifications: He and his team built an exact scale replica of the Jumeirah Essex House that was 10 feet tall.